← Cyber Monday Sale! Use code HOTFUDGEMUNDAE. 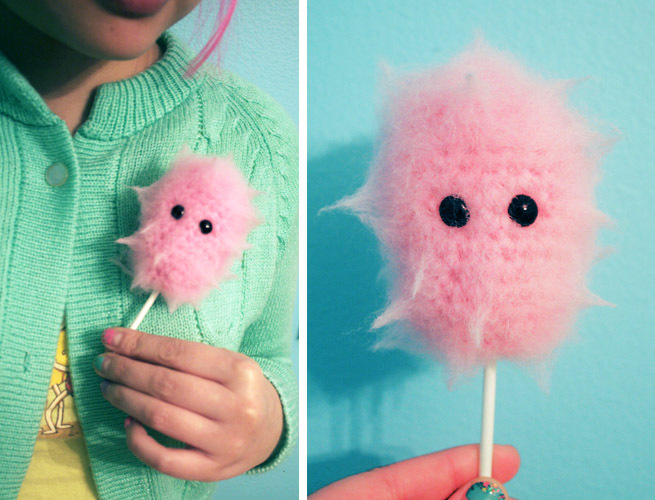 Free Pattern: Plinky’s Favorite Cotton Candy Christmas Tree Ornament! 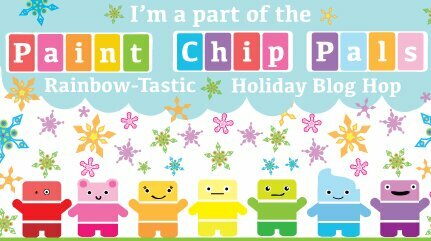 You can also enter a contest to win a Paint Chip Pal by leaving a comment on my blog and telling me who your favorite Paint Chip Pal is. Your name will go into a big pool of entries from other blogs on the blog hop, and Andrea will choose a winner on December 12. 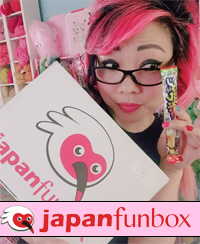 So if you want more chances to win, comment on the other blogs, too! To help celebrate their campaign, I created a fun and easy pattern for you guys inspired by Plinky, who loves sparkle-hunting and eating cotton candy! We threw in one for her buddy Blooty, too! 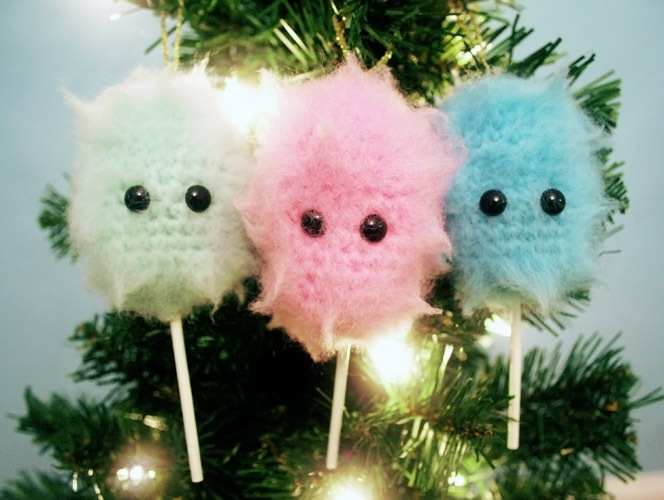 So here are the instructions to crochet your own Cotton Candy Christmas Tree Ornament! Here comes the fun part. 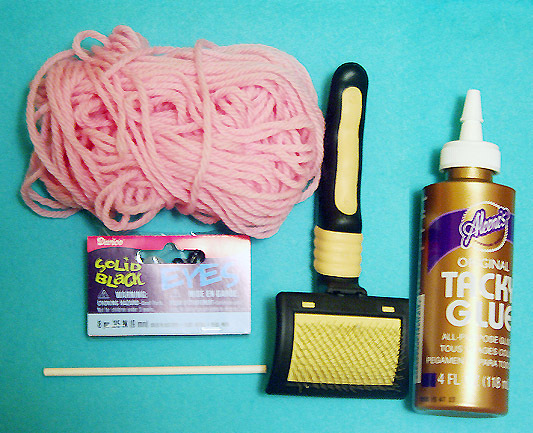 Get your wire brush and start brushing your project to make it fuzzy. Tamie from Roxycraft has a really great tutorial on how to do this here. The longer you brush it out, the fuzzier your project will get. It takes longer than you might think. Sit down in front of the tv while doing it! After getting your project fuzzy, insert and attach your safety eyes. Rnd 7: [sc2tog, 1 sc] 6 times. (12) Don’t forget to stuff your project with polyfill! Rnd 8: [sc2tog] 6times. (6) Break off, leaving about 8 inches of yarn. Thread your tapestry needle with your 8 inches of yarn, weave through the remaining 6 sts, and pull to close, but don’t close too tightly. You still need to squeeze a lollipop stick in there. If you want, you can stick the lollipop stick in there now and close your sts around it. The stick won’t stay without glue, but at least you will know what kind of tension to close your project with. If you are finding it hard to push your stick through the polyfill, just stir it around a little bit as you jab. Finish off, and weave in all ends. If you end up trying out this pattern, please let me know if you find any errors! This pattern has not been tested by any body else yet! 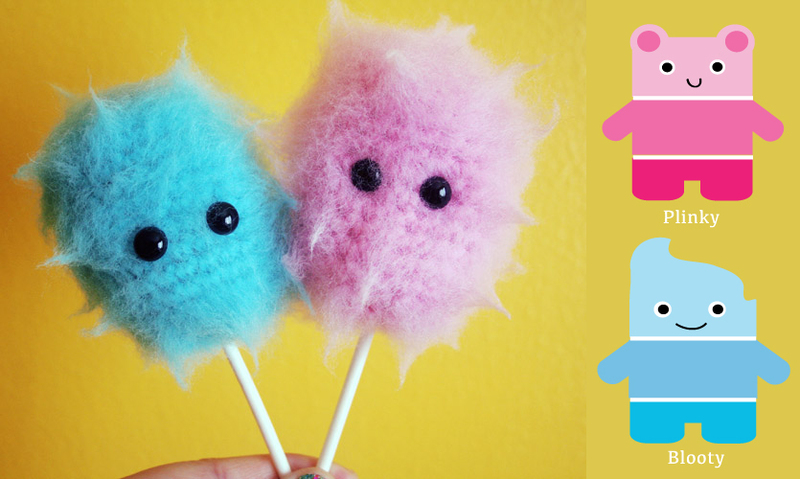 39 Responses to Free Pattern: Plinky’s Favorite Cotton Candy Christmas Tree Ornament! These are just adorable, Good job! For me it was Plinky vs Puurp! Aw I’m glad you like it! Girl you know I tried to stick that on my head! It ended up being a little big tho…… 😛 I’d have to go down a size! This is a good “While I Wait” pattern….. While I wait for the gummy bear pattern! 🙂 Thank you so much, My mom is gonna love this! I hope they post the pattern before Xmas! AWESOME as always!!! Must find time to give them a try!!! Thank you for sharing!!! You are SO SWEET!!! It’s a shame the tune wouldn’t work with English ‘candyfloss’!!! These guys are the cutest and perfect for using up odds and ends!! By the way, has the winner for the Yummy You giveaway been announced yet!?!?! Oh! 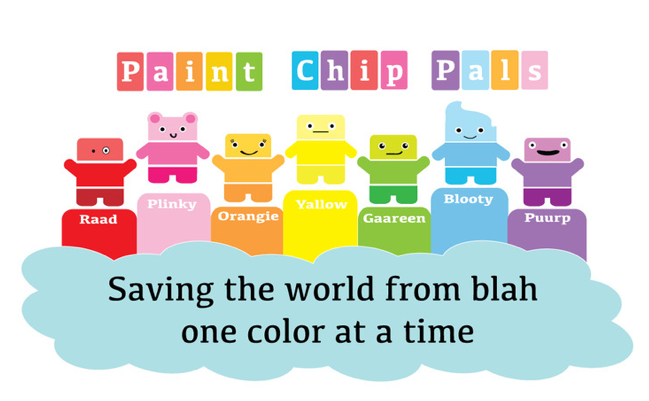 And my fav Paint Chip Pal has to be Plinky! Pinky has to be my fave ^^…it was the cotton candy and roller derby what bought me. I like Plinky. but If I were to win I’d have to go with Blooty for my son. This is too cute! Would you mind if, at some point, I posted a link to this pattern on my blog? Thank you so much! I finally linked to it. If you’re curious, the post is here. Tears are rolling down my face from laughter. He’s kind of freaking me out, too. Awwww I like Plinky and Blooty. Blooty has hair that reminds me of Dylan in 90210 so he’s awesome, and Plinky glitters when she eats too much? Don’t know what that is implying (whuh oh)…. but I like it haha! And I am waiting for those gummy bear patterns too, those are the cutest! oh my goodness, they are so adorable!! I can see how the pink on might end up looking like a tumor on your head, though. 😛 a super adorable tumor!!! also, I think my favorite is Plinky, with it’s cute little ears!! hey, where can i find the white sticks? i really like it! Basically any craft store or place that sells stuff for making candy. 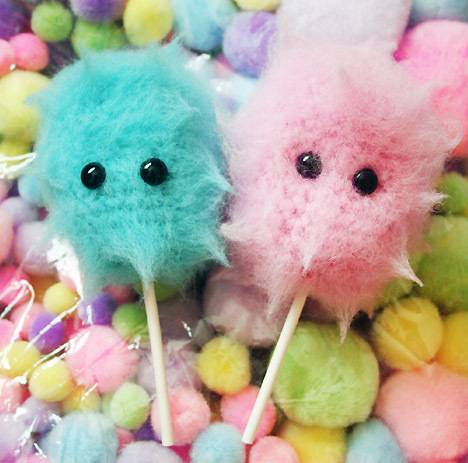 They are lollipop sticks. 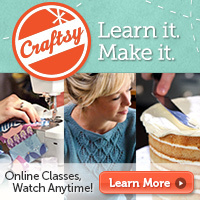 To get ready to crochet Plinky, you should check out Lessons 1-6, then 13, 14, and 16.